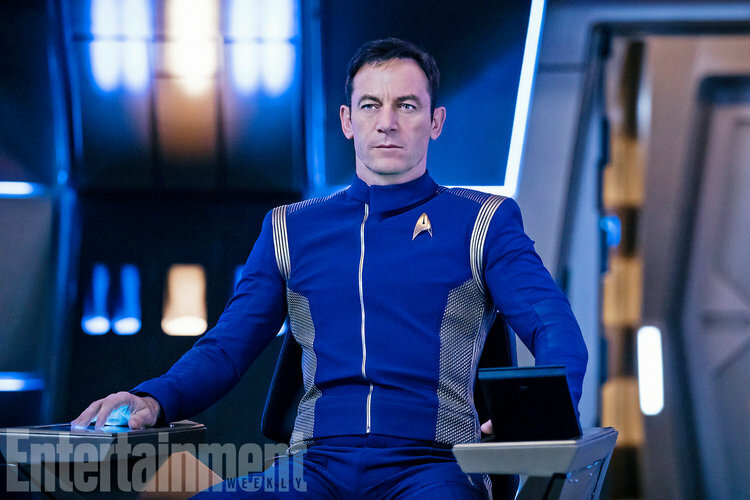 EW has released the first photo of Jason Isaacs as Captain Gabriel Lorca in the upcoming CBS All Access TV series Star Trek: Discovery. Last week, it was announced that it will premiere on Sunday, September 24 at 8:30PM EST/ 7:30 CST, which may end up airing later due to NFL Football and 60 Minutes. It will also be made available on CBS All Access, with the second episode being available on the service right after the broadcast premiere of episode one. After the 24th, all of the new episodes will be available each Sunday on a weekly basis via CBS All Access. The 15 episode season will be split into two parts. Part one will run from September 24 through November 5, with the second half resuming in January 2018. The cast features Jason Isaacs as Captain Lorca, The Walking Dead actress Sonequa Martin-Green as the lead lieutenant commander, James Frain as Spock’s father Sarek, Anthony Rapp as a space fungus expert, Michelle Yeoh as the captain in charge of the Starship Shenzhou, Terry Serpico as Admiral Anderson, a high-ranking official of Starfleet; Maulik Pancholy as Dr. Nambue, the chief medical officer of the Starship Shenzhou; and Sam Vartholomeos as Ensign Connor, a junior officer in Starfleet Academy assigned to the Starship Shenzhou.